During the terrible Allied air-raids on Berlin on the night of 23rd November 1943 the old Kaiser Wilhelm Memorial Church in the city centre was destroyed. The design for a replacement church by the architect Prof. Egon Eiermann surrounded the ruins of the old church tower with a new tower and a separate contemporary place of worship. The new church, which we visited last year, was consecrated in 1961 and is made of concrete, steel and glass. The construction uses a double shell to give acoustic isolation from the busy traffic outside. One of the most striking features is the extensive use of stained glass inspired by Chartres Cathedral, and created by the French artist Gabriel Loire in Chartres. The new church and tower use 21,292 panes of stained glass. The picture above shows the figure of Christ suspended above the altar against the background of stained glass. 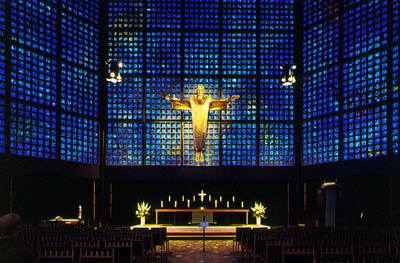 The figure is the work of Munich sculptor Karl Hemmeter, and was created after the original more contemporary design by the church's architect was rejected. Housed in the church is the moving Madonna of Stalingrad which I wrote about at Christmas. Opposite the altar is the dramatically suspended organ by Berlin organ maker Karl Schuke (top below). It has four manuals with sixty-three stops and around 5000 pipes. The stops can be selected electronically in two hundred and fifty six combinations, these can then be expanded using the internal disc drive. The new church and organ are truly remarkable achievements. Now sample the sounds of live music making in Berlin's Kaiser Wilhelm Memorial Church below. Gregorianik & Orgelimprovisationen is a double CD from Picaromedia of organ improvisations and plainchant with organist Wolfgang Seifen and the vocal ensemble Virga Strata. 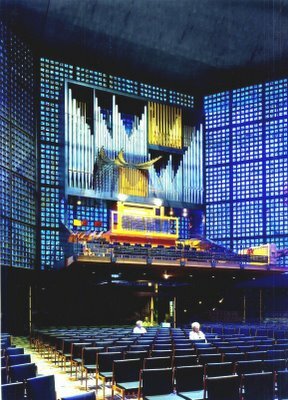 It was recorded live in the Kaiser Wilhelm Memorial Church using the Schuke organ during a concert in November 2004. Listen to samples via this link. Links to music samples of Gregorianik & Orgelimprovisationen were updated in December 2016.